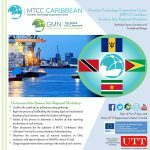 Fulcrum were pleased to be able to contribute to the 3rd sub-regional conference of the Maritime Technology Coordination Centre for the Caribbean Region (MTCC Caribbean). We presented information about how satellite data can be used to support national initiatives (in line with global goals) to monitor greenhouse gas emissions. Thank you to the MTCC Caribbean for their warm welcome and their kind hospitality.